The Picts are an enigma, almost lost in the far reaches of history, a mighty warrior race remembered for appearing in battle with tattoos and attitude. Throughout Scotland there still exist, in carved stones on the roadsides and collections in museums, the tangible evidence of the Pictish culture. In my travels in Scotland I have been very impressed with the way the Picts mastered the use of the spiral, in single, double and triple forms. The animals carved in stone have spirals used for motive emphasis, and the sheer joy expressed in line and fluid movement transcends the centuries. The Hilton of Cadboll stone now in the antiquities section of the National Museum of Scotland in Edinburgh. 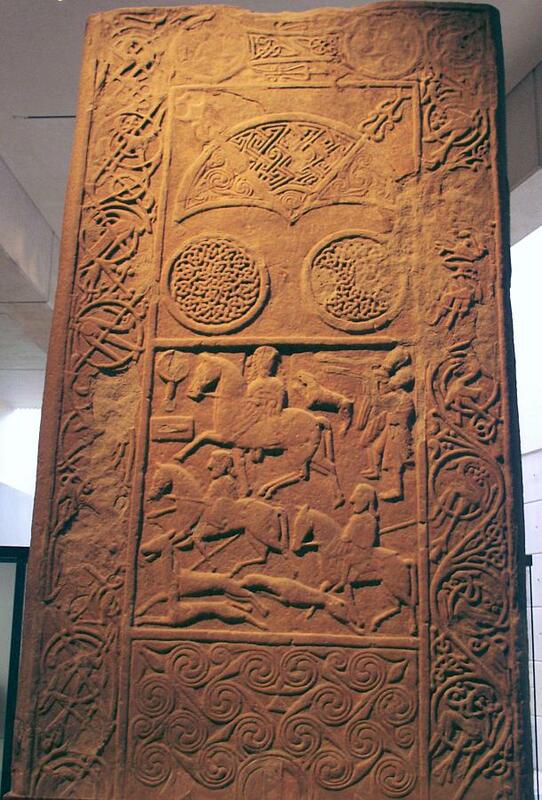 In the Hilton of Cadboll Stone from 800AD there are representational elements, like the mounted hunters in the middle, that feature details of everyday life; like the top one being a woman riding side-saddle! And might those be Irish Wolfhounds or Scottish Deerhounds running beside the horses? These glimpses of ancient times are mixed with Mysterious Symbols whose meaning can only be guessed at now. At the top are a double disc and z-rod, a crescent and v-rod, two amazingly intricate knotted circles, and at the bottom interlocking triple spirals. The sides have birds and animals caught up in vines, all weathered into enigmas. Artifacts such as this inspire me, and I like nothing better than to be able to draw inspiration from them and to bring their intriguing designs to life in skin. I came to my personal connection to Pictish heritage late in life, having been raised in another culture without a connection to my genetic family. When I did meet my true relatives, and learn of my Scots heritage, I began making pilgrimages to Scotland to see if I would feel a kinship with the land. It did indeed feel like a homecoming. I have been extremely fortunate that members of my own clan, Clan Campbell, have been my enthusiastic patrons, and so I have had the opportunity to do our clan badge as a tattoo more than once. Of course, the MOST exciting thing about the ancient Picts is that they were heavily tattooed. Julius Caesar himself wrote in Book V of his Gallic Wars describing them as the "Pictorial People" who "pricked diverse marks into their skin." This means that they are the earliest documented link to tattooing in Europe, and the records state that tattooing was common for both sexes. Here is an entirely fanciful early rendition of a Pictish warrior maiden. Quite obviously, if we look at the designs that survive in stone the tattoos the Picts wore would have been much closer to them than this gal with a floral bodysuit. 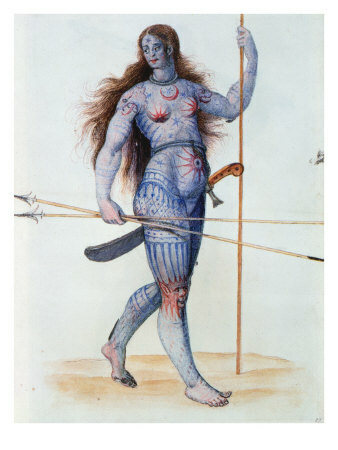 The blue look of this astronomical bodysuit brings up an interesting point, that many people over the years have speculated that the Picts used woad to make their tattoos. My personal experimentation leads me to believe that they may well have had access to both carbon soot and copper, and thus made both black and blue/green permanent tattoos, but that the blue woad was used as paint or dye. 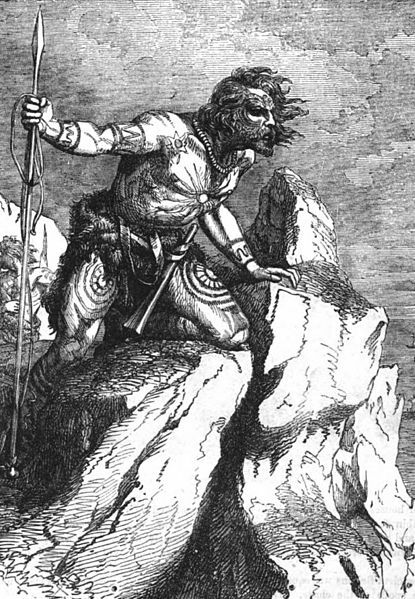 Especially before battle, the woad could be applied and have a slightly hallucinogenic "mood fixative" property that would enhance fierceness and frenzy. An ancient illustration, depicting another proud female warrior striding forth into battle in her altogether. Julius Caesar himself wrote in his book De Bello Gallico “All the Britons dye themselves with woad, which produces a blue colour, and makes their appearance in battle more terrible.” Primarily used as a fabric dye, woad is highly astringent and unsuitable as a tattoo pigment,. But it may well have been used as a wound dressing after battles and thus colored the resulting scars, making them even more dramatic souvenirs of bravery. In the third century Solinius wrote of tattooed Britons in his book Collectum Rerum Memorabilium "That region is partly held by barbarians, who from childhood have different pictures of animals skillfully implanted on their bodies, so that as the man grows, so grow the marks painted on him; there is nothing more that they consider as a test of patience than to have their limbs soak up the maximum amount of dye through these permanent scars." A tattooed Pictish warrior going into battle. In tartan trews and with his hair spiked with lime. The historian Herodian wrote in his Historium "But they puncture their bodies with pictured forms of every sort of animals; on which account they wear no clothing, lest they should hide the figures on their body. They are a most warlike and sanguinary race, carrying only a small shield and a spear, and a sword girded to their naked bodies." In the past three decades I have gone to Scotland many times, and on one of my trips I was privileged to spend a day at the Meigle Sculptured Stones Museum. It has the largest collection of Pictish stones in the country, with 26 very large sculpted stones filling a small tidy building. 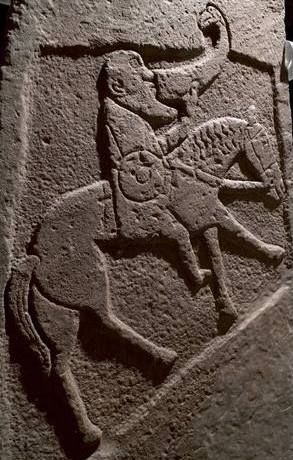 A Pictish equestrian drinking while riding. As an equestrienne, I was particularly delighted to see many depictions of horses on the stones. The romantic in me loved to see the mermaid, gryphons, manticore and numerous dragons. More than anything else, there is much evidence that they loved eels! I know, they may at first glance look like snakes, but I think the artists most loved the play of line and form that could be best accomplished with these slithering creatures. The same emphasis with spiral and line is seen in the boar, bull, and knotworks. Some even say one of the stones depicts the death of Guinevere, who legend says was buried by King Arthur in Meigle after he had her pulled apart by wild animals for her treachery. If you'd like to go and see Pictish stones in their natural settings, you can visit the site of The Highland Council and download a "Pictish Trail" map. "The Pictish Trail takes you from Inverness to Golspie in Sutherland, exploring the mysterious and beautiful carved stones made by the Pictish people who lived in the area from 3rd to 9th Centuries AD." I have made it a personal goal during the last several years to focus more on Pictish symbols as tattoos. Be sure to visit the Standing Stone Tattoos Page to see some examples of carved Pictish designs adapted as tattoos. 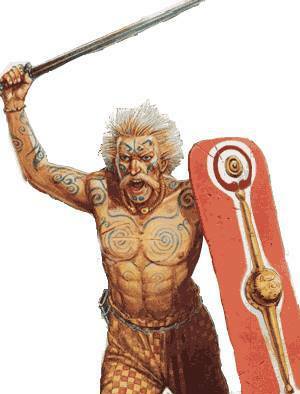 And to learn more about historical references to the Pictish people and their tattoos in antiquity please look at this page on Pictish Tattooing History. I do all sorts of tattooing, but clearly what touches my heart most are the Celtic and Pictish designs. I am blessed that now, through the miracle of the internet, clients come to me from all over the world. I do my best to live up their expectations. Please be in touch if you wish to add something in either of these styles to your personal tattoo collection. where I sell my original Pictish-inspired designs printed on t-shirts and mugs and other fun stuff.